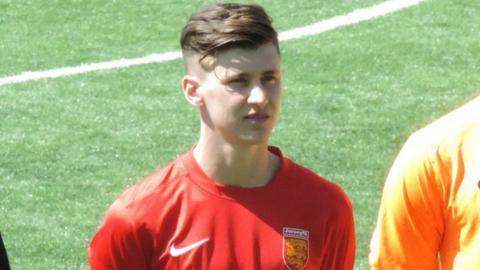 Jersey manager Martin Cassidy says midfielder Cav Miley will be a future skipper of the island side. The 21-year-old wore the armband from the start for the first time as Jersey were beaten by Panjab in a pre-Muratti friendly on Sunday. "I think long-term he's going to be a captain for Jersey," Cassidy said. "I just wanted to see how he reacted to it, that was all - at the moment we've got a team full of captains, we've got a lot of leaders in our team." It was announced last month that former skipper Luke Watson no longer wanted to play for the side, with the captaincy being rotated since. Jersey have the Muratti against Guernsey and the Island Games coming up over the next few months. "He's a top young player, I think he can handle it," Cassidy added to BBC Radio Jersey. "I don't think it put any pressure on his performance." Miley himself said: "It's a huge honour to be a captain of the Jersey football team, but if I'm honest I just try being myself and do what I do every week."